Hey, Mamas! Are you looking to start a mom blog of your very own? Then you’re in the right place. This guide will walk you through setting up a self-hosted blog step by step. Please Note: This post contains affiliate links. This means I may make a small commission at no extra cost to you if you make a purchase through one of these links. Thank you for your support! Step One: Free or Self-hosted? The first decision you must make (after deciding to start a blog, of course) is whether you want to launch your blog on a free or self-hosted domain. Free blogging sites, such as WordPress.com or Blogger, are great for beginner hobby bloggers. They are quick and easy to set up, and (the big clincher) free. Unfortunately, they come with some pretty big downsides, too. Free blogs will have lengthy domain names (think yourwebsitename.wordpress.com) which look less professional and are harder for readers to remember. Additionally, you will have limited customization ability for your site features and design, and the ads that appear on your site won’t make you any money. If you are looking to start a professional looking blog and have any real interest in monetizing down the road, I highly suggest investing in a self-hosted WordPress.org site (not to be confused with their free cousin, mentioned above). With a self-hosted site you can choose your own domain, customize to your heart’s content, and grow your blog as your traffic grows. You will have more options for monetization, and your site will appear more reputable to your readers. With all those benefits, why would anyone choose a free blog? Many people who opt for a free blog worry about the cost and difficulty of setting up a self-hosted site. This post has you covered for setup. As for the cost? Most hosting plans are less than $5 a month. When it comes to hosting companies for a self-hosted WordPress site, the two biggest competitors are Siteground and Bluehost. Having used both hosting companies, I personally prefer Siteground. While using Bluehost, I experienced chronic downtime issues with my website. With Siteground, my website has only been down once in over a year. In addition, I have found their support teams to be more responsive and their platform easier to use. For a more thorough comparison of the two, check out this article by WebsiteToolTester.com. Your site name should match your domain name (this will make it easier for your readers to find you), so if the name you want is already taken, your best bet is to come up with a new name. You’ll want to promote your blog on social media, so try to find a name that has available social media handles. Avoid including hyphens or other punctuation (ex. leah-elizabeths-awesome-blog.com) in your domain. Choose a name that is short and to the point. For some people, your website name will simply be your name. Your hosting site will typically make this pretty easy on you. Simply follow the on-screen instructions provided by your host. Step Five: Choose and Install a Theme. WordPress provides a myriad of free themes you can use, but if you have it in your budget, I suggest purchasing a premium theme that reflects your brand. My favorite themes (including the one on this site) can be found at Studio Press (affiliate link). Their themes are clean, modern, and responsive (a key feature with so many mobile platforms), and their customer service is phenomenal. Other great options can be found at Creative Market. Follow the instructions provided with any theme purchase for installation. Congratulations, You’re Ready to Blog! 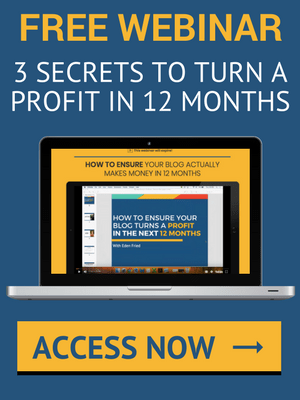 You’re all set up to start your blogging adventure! For more information regarding some of our favorite blogging resources, check out our guide to blogging resources for serious bloggers. Leave me your biggest blogging questions below, and I’ll make sure you get your answer!